In the last face wash with dry ingredients, we combined lavender and cornflower with oats to make a cleanser for all skin types (link below). This time we're doing a super mild mixture for sensitive, dry, and mature skin. This will also work well with combination skin. 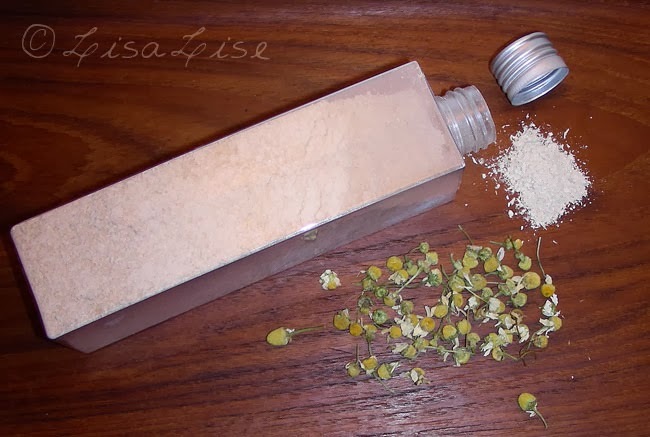 If you like chamomile, this mixture is for you. 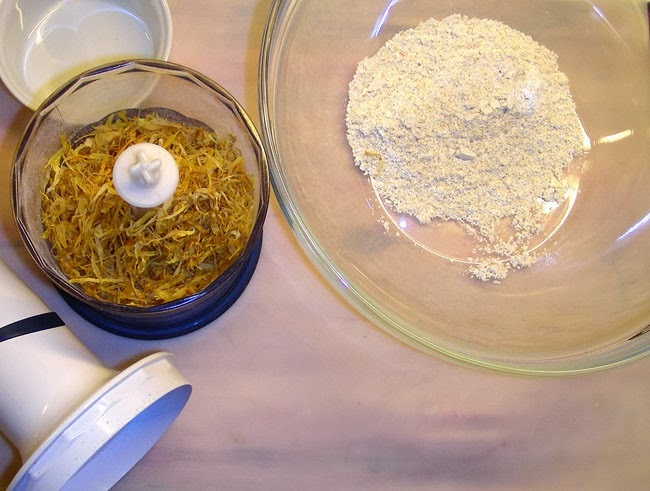 Begin by whizzing each of your dried plants and food ingredients separately until they are as close to powder as you can get them. (Clays don't need whizzing). 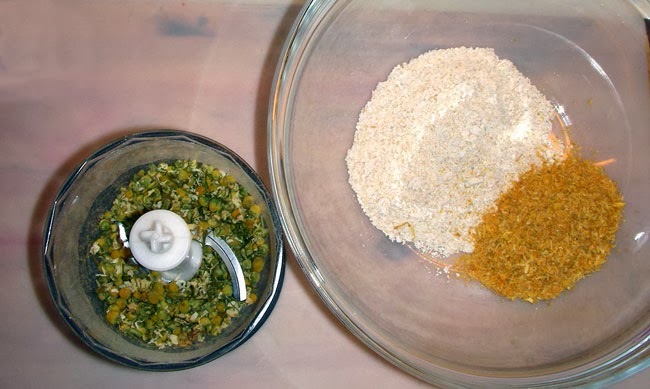 Above is 2 tablespoons of raw oats along with calendula in the big bowl. The whizzing machine has a spoonful of chamomile waiting to be pulverized. 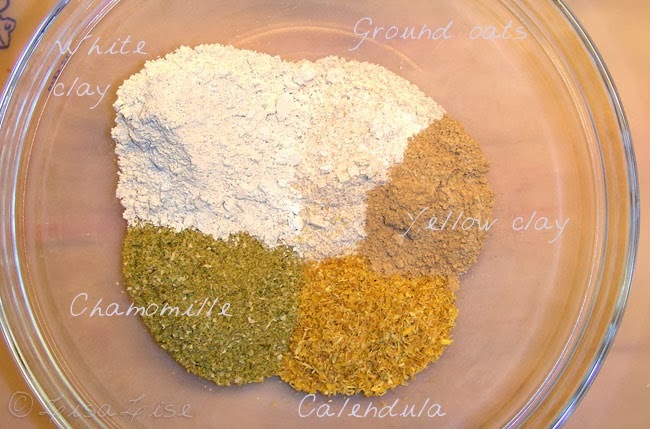 Here are the ingredients in the bowl, ready to be mixed. Even though this recipe doesn't require do-or-die amounts, it's always a good idea to keep notes on how much you use of each ingredient. This recipe was measured by heaping tablespoons. Tip: You can use either white clay or yellow clay for this mixture. I used both because I wanted to create a light yellow mixture that was pleasing to the eye. The cleansing effect is the same with either white or yellow clay. 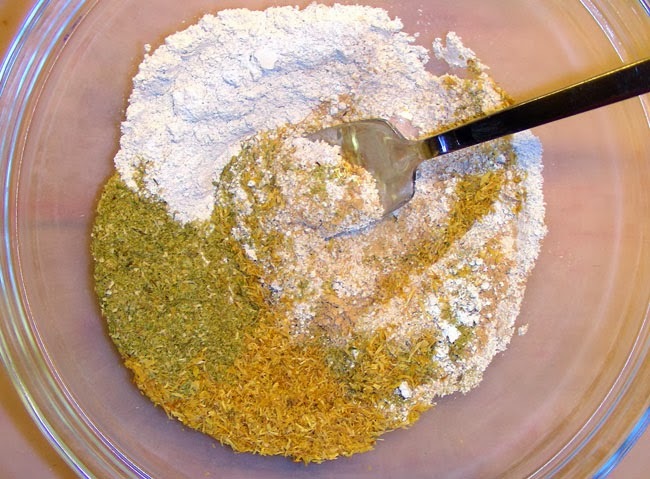 Mix your ingredients together and fill into your container. Voilá! A lovely face wash all ready to cleanse and gently exfoliate your lovely face. Visit this post for the washing method. Be sure to cap the bottle immediately after measuring out a portion when you use this product. Keep the cap and opening of your container completely dry at all times. If ANY moisture comes into contact with your product while it is in the container, you will have created the perfect environment for mold, fungus, bacteria and all kinds of other beasties. I have a question about the clays. I have Bentonite, French Green and Kaolin clay. I find them all different in colour and texture, however when I look them up, the names are used very interchangebly - for instance a site may speak of Green clay and then say it is also called Bentonite etc. Could you please help me with more information about these clays? I have found that my skin has a very violent reaction to my French Green clay (my skin turns violently red, literally in streaks where the clay went on and stays that way for several hours) but it seems fine with Bentonite. Kind regards and much love! HI Beth - this is great input! Thanks for sharing your combination of ingredients. You are absolutely correct in pointing out the use of the clay names, and it is indeed confusing. I have come across this many times (even with my suppliers). The reason: classifying bentonite is something even experts can't agree on. This from wikipedia: ".. the term bentonite, as well as a similar clay called tonstein, has been used to describe clay beds of uncertain origin."